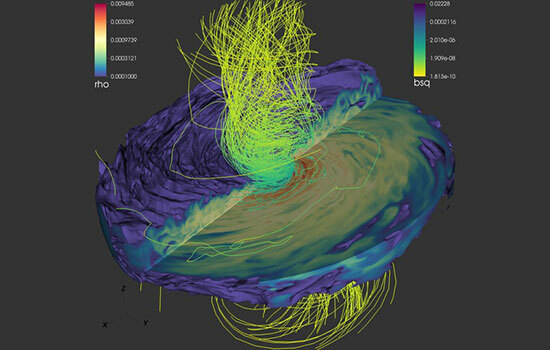 Magnetic field lines emanate from a pair of supermassive black holes nearing merger within a large gas disk in a simulation by RIT scientists. Periodic light signals in the gas disk could someday help scientists locate supermassive binary black holes. A new simulation of supermassive black holes—the behemoths at the centers of galaxies—uses a realistic scenario to predict the light signals emitted in the surrounding gas before the masses collide, said Rochester Institute of Technology researchers. 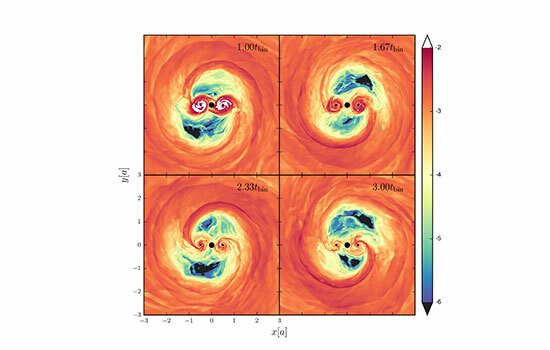 The RIT-led study represents the first step toward predicting the approaching merger of supermassive black holes using the two channels of information now available to scientists—the electromagnetic and the gravitational wave spectra—known as multimessenger astrophysics. The findings appear in the paper “Quasi-periodic Behavior of Mini-disks in Binary Black Holes Approaching Merger,” published in the Astrophysical Journal Letters. 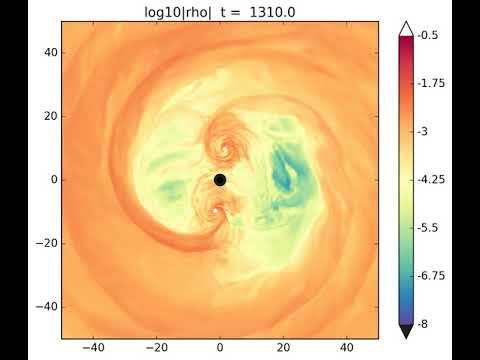 “We’ve performed the first simulation in which an accretion disk around a binary black hole feeds individual accretion disks, or mini-disks, around each black hole in general relativity and magnetohydrodynamics,” said Dennis Bowen, lead author and postdoctoral researcher at RIT’s Center for Computational Relativity and Gravitation. “The evolution is long enough to study what the real science outcome would look like,” said Manuela Campanelli, director of the Center for Computational Relativity and Gravitation and a co-author on the paper. Binary supermassive black holes emit gravitational waves at lower frequencies than stellar-mass black holes. The ground-based Laser Interferometer Gravitational-wave Observatory, in 2016, detected the first gravitational waves from stellar mass black holes collisions with an instrument tuned to higher frequencies. LIGO’s sensitivity is unable to observe the gravitational wave signals produced by supermassive black hole coalescence. Bowen and his collaborators combined simulations from RIT’s Black Hole Lab computer clusters and the Blue Waters supercomputer at the National Center for Supercomputing Applications at the University of Illinois at Urbana-Champaign, one of the largest supercomputers in the United States. Astrophysicists from RIT, Johns Hopkins University and NASA Goddard Space Flight Center collaborated on the project. The publication is based on Bowen’s Ph.D. dissertation at RIT and completes research begun by a co-author, Scott Noble, a former RIT post-doctoral researcher, now at NASA Goddard. Their research is part of a collaborative National Science Foundation-funded project led by Campanelli. Co-authors include Vassilios Mewes, RIT postdoctoral researcher; Miguel Zilhao, former RIT post-doctoral researcher, now at Universidade de Lisboa, in Portugal; and Julian Krolik, professor of physics and astronomy at Johns Hopkins University.